I have recently become a fan of graphic novels, e.g., Persepolis by Marjane Satrapi, and graphic non-fiction, e.g., Health Care Reform: What It Is, Why It's Necessary, How It Works by Jonathan Gruber. 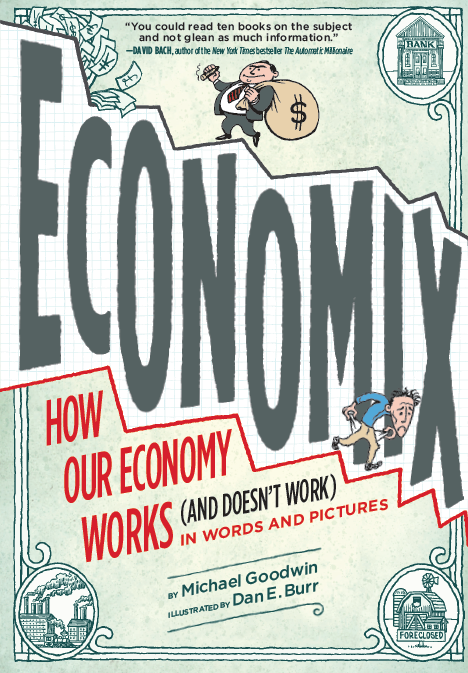 Economix: How Our Economy Works (and Doesn’t Work) in Words and Pictures is another great example of graphic non-fiction that keeps me wondering why the graphic genres are so effective. In Economix Michael Goodwin (author) and Dan E. Burr (illustrator) provide most of us a much deeper understanding of economic theory and practice. They debunk the slogans that make up what most of us know about these things. And they offer practical lessons about what is going on in our country today. Consider the often cited theory of the ‘invisible hand’ that purportedly steers capitalism inevitably toward success. 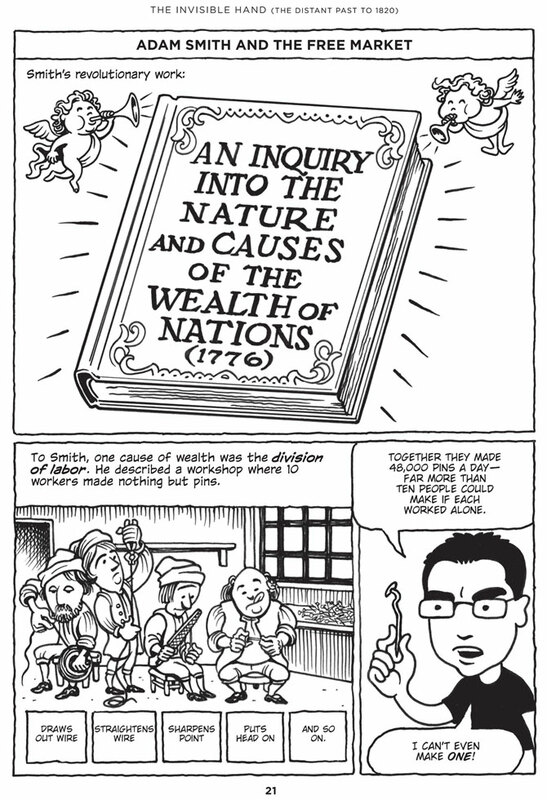 Adam Smith, the Scot philosopher of economics, invented the metaphor of the invisible hand in the eighteenth century. The popular view of Smith’s economic theory, especially among laissez-faire economists, reduces it to the idealized model of economic markets being guided by an invisible hand of competition so that producers and consumers establish a fair price for all goods sold. This popular view leaves out Adam Smith’s other principles, which deal with the need to forbid monopolistic practices and make sure that businesses do not have the power to manipulate the market – a major problem in Smith’s day as now. Goodwin meticulously explains Smith’s metaphor of the invisible hand and then goes on to equally carefully describe how Smith qualified his simple model in the light of business practices. Though the history of economic theory is presented in an entertaining and instructive way, the book quickly moves to the twentieth century and the present, where it takes its time presenting and analyzing major economic events and policies. If you want to understand how international trade works, read the very clear section on international trade between England and France in the 18th century. If you want to learn about how pricing of bonds works, you can find a very understandable explanation in the discussion of the recent economic crisis in Greece. The book is chock-full of economics education. Goodwin doesn't shy away from connecting economics to the larger political context. It presents Karl Marx's ideas in the context of his time. It tells the story of the progressive gains breaking up the huge corporations under Teddy Roosevelt and Howard Taft. The Great Depression and regulation of the financial industry, the growth of the role of Madison Avenue in creating demand through advertising, the dismantling of the regulation of the financial industry starting with Ronald Reagan, and many more watershed political events are all laid out in detail. The portrayal of the Great Depression rings with déjà vu. Hoover made money available, but only to the banks, who sat on it. The public complained about the influence of the banks. One-third of the banks had failed by the time Hoover left office. Did Obama learn from history? He did not undo the Wall Street bailout initiated by Bush, but he did supervise the bailout carefully and by 2010 the federal government actually made a profit on the troubled assets it bought. Goodwin provides an analysis of the negative impact of large corporations on democracy throughout history. He concludes with a call to action to preserve democracy, arguing for the importance of democracy to an economic well-being. Let me close by trying to answer the question why it is that the graphic genres are so effective? 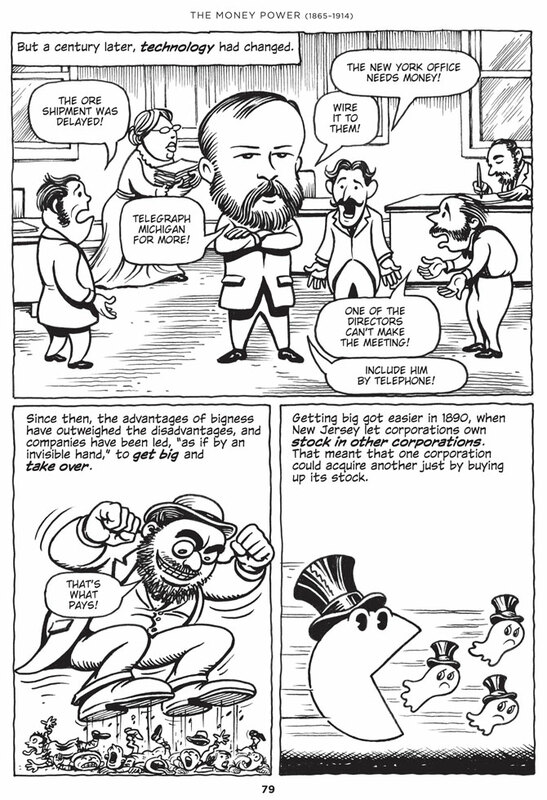 In the graphic frames of Economix Dan E. Burr represents body language and events. Our eyes can take a break from the printed word regularly and our minds can speculate on the facial expressions and the data. Take a look at the first page below introducing Adam Smith's economic theories and the second one on the growth of corporations. See what you think. Click images to enlarge. Then be sure to visit to visit the links Goodwin provides for further reading.